I’ve been given the opportunity to have a FREE booth at the National Convention of the Registered Interpreters of the Deaf (RID). This surprise blessing will allow me to contact many of the 1000 Registered Interpreters for the Deaf who will attend the conference in New Orleans. Being able to sell book at a large conference is a fabulous opportunity to make contacts, and hopefully sell a few books. How many? That is the great unknown, but a good estimate might be 5-10% of those who visit your booth. 1. Freebies are a great attention getter. In New Orleans, that means Mardi Gras beads. 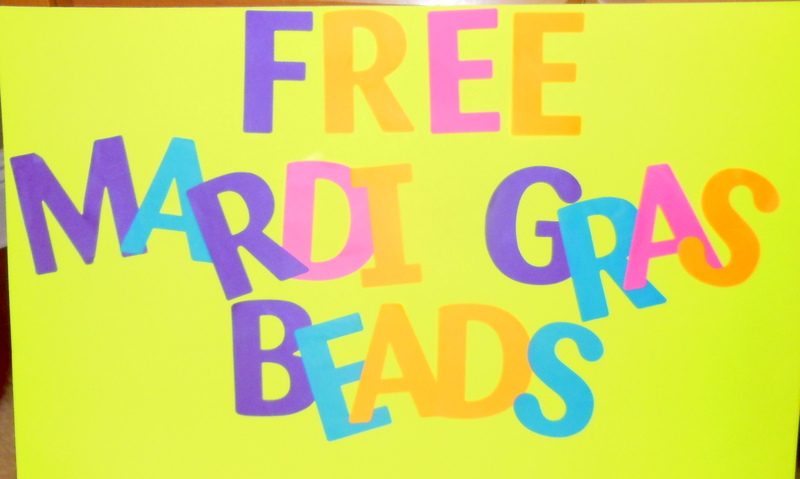 I will give free beads to anyone who stops by my booth. If you don’t live in New Orleans, buy inexpensive items to give away: candy, gum, pencils, or some unique item from your area. 2. Postcards are a great informational tool. Many people at a convention have stretched their budget to the max with travel costs, meals, etc. and may not be prepared to buy a book. A professionally printed postcard is a great way to promote your book and create sales after people have returned home. Less is more when it comes to postcards.The front of my card has a color photo of Amy Signs, and a blurb about the book and where it is sold. The back has author photos and quotes from the book. Use one font when designing your card, Arial or Times New Roman, and never use a font smaller than 11 pt. I bought 500 cards, printed on both sides for $66 from Vista Print. Printed on one side only is cheaper and allows you to mail the postcards. 3. Your display should be eye-catching. Use LARGE posters, balloons, and a bright table-cloth. I’ll have purple, green, and gold mylar balloons. A gold tablecloth (bought at the $ store), and colorful beads on the table and stacks of Amy Signs. 3. Have clear pricing. If you can offer special pricing, do. . Nothing helps sales like a bargain. I’ve indicated what on-line and bookstore price is and I’m selling it for $2 less. 4. Bring Money. Nothing kills a sale faster than not having the right change. Have a supply of $1, $5, and $10 bills. 5. If you can take Credit Cards and Debit Cards you will sell more books. Most newer phones, iPads and other electronic devices can accept credit cards with a simply reader. Make certain wifi is available at your booth. 6. Smile. Wear a tee-shirt that promotes your book. Wear a funny hat. In other words, stand out in the crowd. And don’t forget to bring plenty of pens to autograph those books. 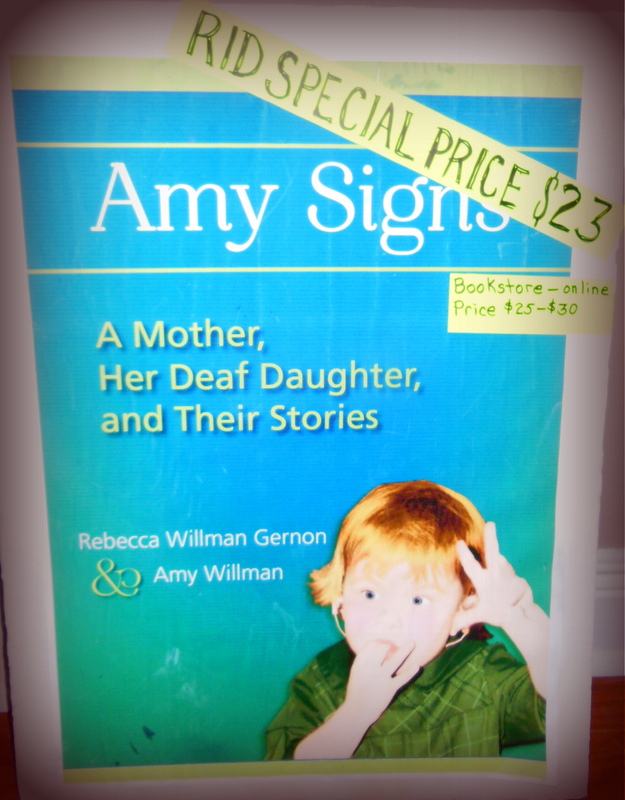 Amy Signs (Gallaudet University Press) is available from Amazon, Gallaudet University Press, and at major book sellers. If you want an autographed copy, contact me via the form below. Next Why blog? And about what?